Earlier this month, Paws & Think, an Indianapolis-based nonprofit organization focused on the human animal bond, received a $9,000 grant from the Indianapolis Foundation, a CICF affiliate. These grants are given to provide immediate and intentional programming focused on community safety and preventing crimes committed by youth and adults, which Paws & Think demonstrates in its Youth Canine Program. Started in October of 2013, this 5-day program takes place each month, and involves youth from the Juvenile Detention Center training dogs from Indianapolis Care and Control. 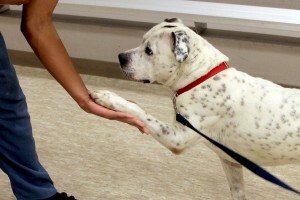 This basic obedience training helps increase the likelihood of the dogs being adopted. This recent grant will be used to add a kennel area to the Juvenile Detention Center. Rather than returning to Animal Care and Control after each training session, the dogs will now be able to stay at the center throughout the length of the program. This will not only allow the dogs to spend more time with their trainers, but also give the trainers a greater sense of responsibility and pride as they care for the dogs. Paws & Think would like to thank the Indianapolis Foundation and everyone who was involved in the grant process. This is a win win situation. Keep up the good work. This is a wonderful idea and wonderful program. Youth need something to do, look forward to and be responsible for. This pulls at your heartstrings. Congratulations that it is a success. And …….. the animals benefit from it too.